Cecil County is partnered with a network of state and local agencies, creating an entire support infrastructure around those struggling with addiction, providing guidance and reinforcement every step of the way back. During the winter of 2013, the Cecil County Local Overdose Fatality Review Team (LOFRT) was established to study overdose deaths and advance overdose prevention planning. Participating members of the LOFRT consisted of representatives from: Cecil County Adult Drug Court, Cecil College, Cecil County Drug Task Force, Elkton Police Department, Department of Emergency Services, Haven House, Cecil County Health Department, Department of Juvenile Services, Cecil County Public Schools, Serenity Health, Department of Social Services, Union Hospital, Upper Bay Counseling and Support Services, et al. Utilizing a multidisciplinary approach, the LOFRT investigated intoxication deaths within Cecil County in order to determine ways to prevent future deaths. Multiple observations and recommendations were suggested by the LOFRT team members, including a need for increased public awareness regarding opioid misuse. During the winter of 2015, LOFRT members agreed to form an Opioid Misuse Prevention Project (OMPP) Coalition. The LOFRT/OMPP Coalition, via the Cecil County Health Department and with funds from the Substance Abuse and Mental Health Services Administration and the DHMH-Behavioral Health Administration, contracted with an experienced public relations/communications firm. The firm was asked to develop and execute a marketing and public awareness campaign focused on opioid misuse prevention with primary, secondary and tertiary prevention messages. Objectives for the campaign included (a) increased community perception of risk/harm for non-medical use of opioids, (b) increased community knowledge for, and utilization of, appropriate disposal methods for unused prescription medications [i.e., drug take-back boxes, and drug take-back events], and (c) an elevated public awareness of resources for treatment and overdose prevention. 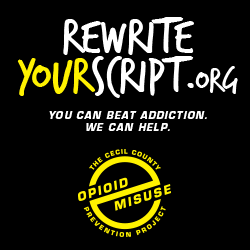 The selected firm was asked to help with marketing and communications strategy development, creative services, and the purchasing and placement of media services for the execution of a public awareness campaign focused on opioid misuse prevention and related activities within Cecil County, Maryland. Get a badge for your website. Use these badges on your website or in your email signature.